Even as a young child in his hometown of Monterrey, Mexico, Dr. Perez knew he wanted to pursue a career in medicine. Although no one in his family had attended college, Dr. Perez and his older brother committed to pursuing their medical aspirations. While still attending medical school, Dr. Perez gained early surgical experience by following his brother, then a general surgery resident, taking on-call responsibilities and helping in surgeries at the hospital. 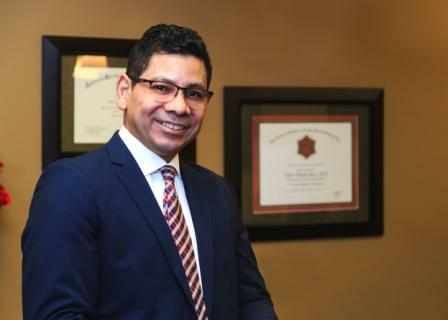 After being accepted to a surgical residency at University Hospital in Monterrey, Mexico, the nation’s most renowned medical school, Dr. Perez decided to focus his efforts on practicing in the United States, where he moved to complete his training. During this time, he completed residencies at Cook County Hospital in Chicago, Illinois (transitional year residency); Western Reserve Care System in Youngstown, Ohio (general surgery residency); and Loma Linda University Medical Center in Loma Linda, California (plastic surgery residency). In 2002, Dr. Perez became assistant professor of Plastic Surgery at the University of Kansas Medical Center and served as the director of the burn unit. He opened his private practice in 2009, and continues to serve as the Chief of Plastic Surgery Service at the Kansas City VA Medical Center. He continues to teach Plastic Surgery residents from the University of Kansas Medical Center as an Clinical Assistant Professor of the Plastic Surgery Department. Today, Dr. Perez is a board-certified plastic surgeon with more than 25 years of surgical experience. His broad range of training and medical expertise provides him an unparalleled understanding of plastic surgery techniques. He has helped to enhance the appearance and lives of thousands of patients with proficiency and an unwavering passion for excellence. Dr. Perez has been working at the Veterans Health Administration Medical Center since 2002, right after he completed his residency at the Loma Linda University Medical Center. Military veterans who have heroically served our nation commonly experience injuries, illness and disease, and for their service they deserve effective, compassionate treatment. Dr. Perez is honored to have the opportunity to offer reconstructive and plastic surgery for our nation's heroes. There are more than 9 million veterans enrolled in the VA Health Care System. There are about 20 million people in the veteran population overall, with about 195,000 veterans living in Kansas as of September, 2017. If you or a loved one is a U.S. veteran who is not enrolled in the VA, we encourage you to call the Medical Center to learn more about your benefits. Dr. Perez is passionate about providing these surgical services in addition to his cosmetic private practice. Schedule your initial consultation with Dr. Perez to find the procedure that's right for you. Call Renue Aesthetic Surgery at 913-685-1108 today. Dr. Perez and his team serve patients throughout the Kansas City area in both Missouri and Kansas, including Olathe, Lee's Summit and more.